As the founder of a startup, everything starts with you. Unfortunately, most entrepreneurs have no idea what it means to be a great leader. I was the founder and chief executive of my own company in 2002 at the age of 22. I was accountable for everything at my company. I certainly felt like a CEO, but after eight years, I realized I was not, and I was lost. I was young. I didn't have any business mentors. I was on a soul search that eventually would lead me to understand my true role. What happened was I joined a peer group of fellow business leaders in my local community. For the first time, I was surrounded by CEOs who had been in the position for a much longer period of time, and who were much more successful than me. For the sake of reference, this group of CEOs who I learned so much from (and whose names I must keep private), are the heads of companies with annual revenues ranging from $5 to $500 million. It was at this point that I finally began to see living examples of real leadership in play. And this changed my perspective about who I thought I was and who I was striving to be. You are the link between everything outside and inside your company. I think of it as being an intergalactic traveler. I get to travel from Earth to other planets, and vice versa. I am the link between the inside – Earth – and the outside – Planet Sparky (named after my alien-looking French bulldog). At your company, you are the intergalactic traveler. Your company is the inside and the marketplace is the outside. It's your job as CEO to see opportunities others do not. Most of your organization (with the exception of sales people) tends to focus internally, and it's difficult for them to shift gears to focus externally. Therefore, you are to fill that void. This is not to say that you should not engage and intently listen to your internal employees. This simply means you ultimately are the one who must make the decisions. Define the meaningful outside. It's all about looking at the outside factors affecting your company and defining what is important and what is not. Everyone on the inside depends on you to define the outside. Take Ray Kroc, McDonald's founder, as an example. People have always eaten out, but it was Kroc who defined the outside in a way no one before him ever did. His meaningful outside is, of course, now known as fast food in America and globally. If you look at your company and all of the outside influences affecting it, what matters the most? What doesn't matter? Decide what business you're in (and not in). There are an unlimited number of businesses you can be in. How about selling language learning programs to dogs? How about selling sweaters and fleeces in Florida? How about selling data mining software to governments? How about buying a global pharmaceutical company Sterling Drug when you are Eastman Kodak? What?!? You get the point. Markets are ultimately your decision. Consider KISSmetrics as an example. At one point, Neil Patel and Hiten Shah (the co-founders) decided that internet marketing was the business they wanted to be in. They're talented people, so they could have started any other company, but their experiences, skills and contacts were in internet marketing. When deciding your business, consider all of the above. Making the wrong decision is usually terminal. Balance present and future. As founder and CEO, you have to make sure there's a tomorrow, but you also have to make sure there is a today. You need to constantly balance the needs of the company today with what the needs of the company may be tomorrow. For many companies, this comes in deciding on budget investments. Going back to the failure of Kodak (there are many, but we'll focus on one), looking back now, everyone and their mom knew that digital would crush the film business, especially Kodak. They invented digital. But, it was a strategic failure to not invest in the present that ultimately led to no future. This lesson goes the other way as well. Prematurely investing in technologies when you cannot afford to, or that markets aren't ready for, will lead to early demise as well. You have to carefully balance today's present and tomorrow's future. 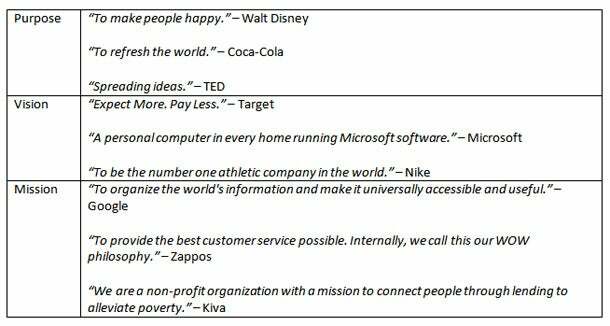 Purpose: This is why your company exists in the first place. It's timeless. It's fundamental even. This is the reason anyone should even care about your company. Vision: This is what you're trying to make happen. In other words, when your company succeeds at what its purpose is, what does that look like? Mission: This is how you accomplish your vision. It's not the entire plan; it's the super broad strokes of your plan. This explains how you do what you do each day. This responsibility really is my No. 1 even though it's third on the list. All responsibilities herein are of equal importance, except for this one, which is above all else. Academia will preach that core values are important. I'm here to tell you they're everything, but only if you actually own them. If you don't own them in your heart, don't even bother with them. Leave them out because it'll do more harm than good. I'll do my best to share with you my perspective, but for the proof in the pudding look no further than Zappos. Your company's culture is a direct result of your company's core values. You cannot demand culture. You can't throw out quotes at company meetings to convey culture. You can't incentivize culture. Culture is simply a result of the core values you enforce. The secret lies in how you enforce your core values more so than what your core values are. Do you hire for values? Do you terminate for violating values? Ask yourself this question: if your #1 salesperson violated your core value of honesty, would you terminate him or her? Every action you make, from the large ones to the small ones are seen and felt by everyone in your company. They always speak louder than words on the wall. Your core values define who you are. It's your DNA. It's what makes you, you. When core values are real, big decisions become easy, and small decisions compound to provide huge impact. When you know who you are, decisions usually can go only a few ways. For example, we started our new social enterprise fund BeSmartee, backing three different businesses with the goal of picking one and focusing only on that. When it was time to make a decision and drop two, we had a bit of a dilemma. One had become cash-flow positive within two months, but we weren't having fun. One was a huge emotional attachment because it had everything to do with my mom's cancer, but it wasn't a project we were enjoying. And, the last was the reason we got together as a team in the first place, but there was very little execution. Ultimately, we looked to our core values of passion and real. We realized that we had to do what we were completely passionate about, and that whatever decision we made, we had to be absolutely real to ourselves. Then, the decision came quickly, and we decided to focus on our first initiative. Many founders and CEOs I've met are really good at this. They're really good at determining where to go and the overall strategy of how to get there. After all, it's usually the Founder who took the company from nothing more than an idea with a few thousand dollars in cash to where it is today. Strategic direction is all about the major moves the company needs to make to reach its objectives. You do this by setting and communicating the right company goals first. Next, you define what success looks like. Then, in the words of Stephen Covey, you "begin with the end in mind" and work backwards. Now, it's important to note that No. 4 on the list is actually a responsibility you share with your team. If you don't, you will be responsible for your own company's stunted growth. You cannot be the only person who figures out how to accomplish major objectives. Lead your team to help figure out the how, and the how of the how, and get out of the way. And, if you ever want to sell your company (trying to be rhetorical here), you need to learn how to share this responsibility and share it well. Consider Jim Collins's book From Good to Great where he introduces the Level 5 Leader. If you haven't read this book, you should; it is the business book of the last decade. He talks about a Level 5 Leader as having a shared set of characteristics, such as being humble, and my favorite, being able to set up their successors for success. To me, the results speak for themselves, as Level 5 Leaders create companies that outperform and outlast their competitors, and it all starts with preparing your team and company. How many founders out there were the people who recruited the team, sold the dream and brought people together for a common goal? Never stop looking for key talent and never stop developing them. I've seen so many Founders build a team, get to work, and then forget to do what was one of the most important things they originally did – build the team and develop the team. Again, stunted growth will be a result. As the director of your own movie, don't forget the lessons that Hollywood knows so very well, that everything starts with the team. Where would Danny Ocean be without Ocean's Eleven? Where would Neo be without Morpheus and the Nebuchadnezzar? Get that team together and never stop building. I always wanted to be a professional basketball player, but when my growth stopped at 5'11" in the eighth grade, my dreams were crushed! So, the next best thing was to look at my companies like basketball teams. Imagine you're the owner of an NBA basketball team. You know you can't play the game. You have players to play the game, and these players need to focus on the game. It's difficult for them to play the game if the team bus is always breaking down, if bad press is destroying morale, or if the doctor you have on staff is too busy running his private practice to be around. All these things are preventing the players from focusing on the game. Your job is to make sure any obstacles that are in the way, any large boulders blocking progress, are removed and disposed of, or at least pushed to the side of the road. You could let your team do that, but then who would be playing the game? It's your job to make sure your company and its people have all the resources needed to be successful. Resources can be categorized into four major categories: financial, human, physical and intangible. According to Dun & Bradstreet and the Small Business Administration, approximately 75 percent of businesses will not make it through their first three years, and the No. 2 reason is the lack of funding, i.e., cash. So, if you are lacking in financial resources, then go seek capital. Human labor is your largest cost and your largest asset, so give employees everything necessary to be successful and let them play the game as you hired them to. To me, this means the proper training, leadership, incentives and culture. For example, leadership is one of the best ways (and free) to empower your people. It's amazing what a simple "thank you" or five minutes of listening to an employee's concerns can do to boost morale and production. It's funny to see a company spend millions on talent, only to be stingy on a second monitor or refuse to spend a few thousand dollars on proper décor. How you value your employees will be clearly on display. An easy place to start that I personally blundered on was not buying a coffee maker for the office. Seriously. It took one of our sales people bringing one in on her own dime for me to consider all the little things that make such a big difference. Intangibles are resources many of us don't even realize exist. The market and operational knowhow that you and every employee at the company have is critical to tap into. The life experiences and contacts people hold are powerful. For example, did you know your newest accounting clerk's brother in-law works at a major potential client? But it doesn't stop there. What about your intellectual property? Can that be licensed or repositioned in different markets? What about your reputation in the industry as a thought leader? Don't lose sight of the fact that you provide the court, the ball and the players. They fill the stadium, they play the game, and they are the only ones who can win the game. You may have a CFO that does your forecasting and modeling, but it's your job as CEO to determine where money gets allocated. Does your cash go to more development? Sales? Marketing? Incentives? How are you going to balance the need for new software tools versus a human resources program within your budget? Whatever it may be, you decide. A poker player friend once told me, "Think of your chips like ammo. Don't give them away foolishly." If you're not able to focus on budgeting because you're acting as Controller/CFO, or if you're using your CPA, I would highly suggest hiring a part-time CFO. They are typically understanding of where your company is financially. There are many great companies out there. In particular, we've used B2BCFO with great results. Where you allocate money tells everyone in your company what you value and what you don't value. Your strategic decisions should be made in alignment with your cash resources. You determine where money goes, which determines what gets done, and that decides the fate of your company. It's important to note that this list evolves every year for me. So, every year always take into account where your company is, what your resources are, where you're going, what your objectives are, and who you are at that moment in life.